For those of you who appreciate Ridgid’s aim to produce quality tools at prices that won’t put you in the poor house, take a look at the new Ridgid tools coming out for late 2018 and early 2019. Ridgid’s got a little something for everyone it seems, and much of the new product offerings have been optimized for the brand’s new Octane battery platform. One of the newest editions to the Ridgid 18V brushless line comes to us by way of the MegaMax system, a system that combines a power base with any one of 3 interchangeable heads. We put it in the hands of our remodeling crew, and it also earned a Pro Tool Innovation Award for 2018. The Ridgid MegaMax power base, although compatible with any of Ridgid 18V batteries, has been optimized for use with the brand’s Hyper Octane batteries. With the supercharged battery line, users get 65% more power for higher-demand applications, better performance, and increased runtimes. The Power Base automatically identifies each of the MegaMax attachment heads and configures its settings to maximize performance for that specific attachment. The Power Base Emits an audible beep when the attachment head has locked on. It also features an LED panel to inform the user of the status of the tool. The rotary hammer head fits in the 1-1/8″ class, and it has enough impact energy to compete with other Pro brands. In chisel mode, you can lock the tool on so you don’t have to hold the trigger the entire time. Incidentally, Ridgid is the first to offer that feature. Paired with an Octane battery, the MegaMax is the industry’s most powerful reciprocating saw. It only runs $69 for the head. Even coupled with the Power Base at $99, this combo comes in at less than you’d spend on most Pro-level recip saws. The MegaMax Right Angle Drill Head has plenty of torque and a smooth start. When we used it, we didn’t experience any binding or general jerkiness, which is a good sign. Although its aux handle and top grip could get in the way in tighter spaces, you can remove them relatively easily for better clearance. This new one-handed recip saw joins the brand’s Octane lineup of high-performance tools. It features a brushless motor and advanced electronics, which provides the tool best-in-class power and intelligence. According to Ridgid, this recip saw delivers 3X more power and 30% less vibration than Ridgid’s previous corded version. 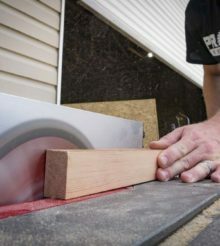 Plus, with the option of using rotary action, you can use the one-handed recip saw to cut through both wood and metal. With the Octane battery, this brushless 18V sheet sander can deliver 14,000 OPM to sand down material quickly. A digital selector allows users to choose between 3 different speed settings, while Ridgid’s AirGuard technology allows for up to 90% dust collection. Ridgid also includes a front grip that effectively keeps your hand from sliding down and scraping the skin from your knuckles. One of the more compelling Ridgid products we’ll see this winter is the 18V Mat Light. Blasting your workspace with 1,500 lumens worth of brightness, it can lay flat, roll up, or hang. Wrapping it backward turns it into an area light, or, you can hang it from its metal hook for a flood light. It comes with its own battery adapter and you can even charge other devices via the light’s USB port. Most of what you’ll need to know about this compressor you can figure out by reading its title. However, it might also tickle your fancy to find out that this compressor also includes the brand’s Strong Start technology, allowing users to reliably start the compressor under any power situation. It can hold 200 max PSI and fires off 5.1 SCFM @ 90 PSI. The overall design gives it a good balance of portability for the job site and power to use as a small shop or garage compressor. Ridgid’s upcoming 18V Butane Heat Gun release looks to get things nice and steamy with its 1400° top end. It can hold temperatures above 1200° for over 25 minutes, and it has a cooldown mode that allows for quicker storage and better durability. Look for this one towards the end of 2018. Yet another tool added to the Octane roster of cordless tools from Ridgid, the brushless Jig Saw aims to maximize performance for heavy-duty jobs. It has a variable speed trigger, variable speed dial, and a Line-Start mode that starts slowly and increases the speed as the work material is engaged. It also has a sight line blower that clears your cut line from sawdust, and orbital action that moves through cuts more quickly. The Octane line of 18V tools will soon include this sweet Ridgid hand planer for your woodworking applications. You can even throw the harder woods at it, like oak, thanks to the improved power coming from the Octane battery. This handy little planer also includes the industry’s first adjustable chamfer depth, allowing users options for customizing their finish work. Prepare to get your fill of new finish nailers, cause Ridgid is releasing two new models. The first one is this 16ga 2-1/2″ Straight Finish Nailer. It features the Ridgid’s Clean Drive technology, which includes a small nose for improved visibility, no MDF blowouts, no driver blade slips, and will drive flush at angles. It also features a tool-free selectable trigger, and a tool-free jam clearing door for those rare occasions when you do come across a jam. You can also kiss daily oiling goodbye, as this model features an oil-free motor. Not gonna lie, if you liked what you saw from the last nailer, you’re in good shape here too; this nailer has the same features as the last one. There is one noticeable difference though: this finish nailer is angled and takes 15ga nails! If grinders get you all hot and bothered, you’re about to get a double shot of the good stuff from Ridgid. The first Octane model, coming out in Q1 of 2019, is a 4-1/2″ grinder that will deliver an industry-leading 10,000 RPM. It includes an LED overload protection indicator, a 3-position auxiliary handle, and lock-off protection that prevents an accidental start when a fresh battery gets installed. The second grinder Ridgid plans to release soon is the Octane Brushless 18V 7″ Grinder. It runs off of one or two Ridgid batteries, Octane or regular. It features a Twist Lock, which allows for three different head position changes for increased versatility and comfort. It also includes an electric brake, a multi-position handle, and a 2-finger lock-on trigger. Expect this one out towards the end of 2018.